Go to CedarspringsTV ON THE NFHS NETWORK and you can see all the stuff that we do. In just a short time the class has done some tremendous things. We have filmed live sporting events, academic assemblies, the Red Flannel Queen's Pageant, and our announcements are going right along. Don't get us wrong though - we are trying to improve even more. 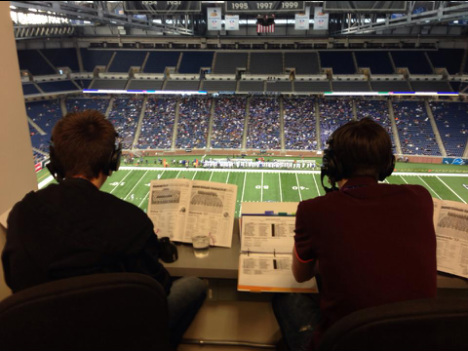 (at left) 2014 Seniors Kyle Maka and Kody Hall calling the Division 1 State Championship Football game at Ford Field. What a great experience.